Dustin Keith only wants two things in life; to have fun and marry his childhood sweetheart. When he finally wins the approval of her traditional father, he thinks that things couldn't get better. 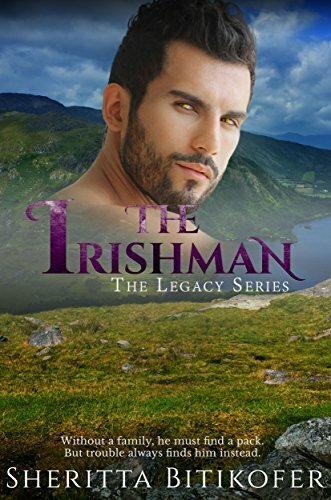 But when what should have been a blissful wedding night turns into a walking nightmare, Dustin must come to grips with a part of himself that harkens back to the old-world superstitions that he thought he could leave behind when he said his vows. After shifting for the first time into a faoladh - werewolf - Dustin flees from his homeland and washes up on the shores of France, where an alpha and his family take him in to nurse him back to health. But Dustin couldn't completely escape Ireland and danger follows him all the way to Darren Dubose's homestead. This is the seventh book in the series but trust me you can read it as a stand alone . We finally get to dive deep into Dustin's back story and we find out so much about him. All he wants to do is marry his childhood sweetheart and live a good life. Well you know things don't happen as they should and on his wedding night the unthinkable happens, that start a chain of effects that bring back some old world superstitions and part of him that he thought he could hide . What can a werewolf do after his first shift is to run and find more of his kind . When he ends up in France things change when the Alpha takes him in to help him and nurse him back to health But will he survive the danger that is coming to claim him. I have loved Dustin's character from the very first time I met him . He has also been one of those characters that you so want to know more about . He was such a mystery that the author now brings to light . He past has been shrouded We see him as a carefree man in love which is so much fun to read . He is still strong and tough and wants what he wants but you do see a gentler side to him . You see him struggle along the way also and how he uses his past to help him in the future . When you see him in France you see him as part of a family . You will fall in love with him and the rest of the pack . This is book 7 in the series but you can read this as a stand alone. The author takes us on a great ride . There is history of the main character and you see the struggles they went through . The characters are well written and complex . The story is very captivating . I started this book in the afternoon and had it done in a couple of hours . I have read this authors other books , not in order I will say . I have had no trouble following the story lines at all . This is a sad story but the author turns it into a happy story by the time you are done reading . I would add this book to your Halloween reading list and read it tonight .